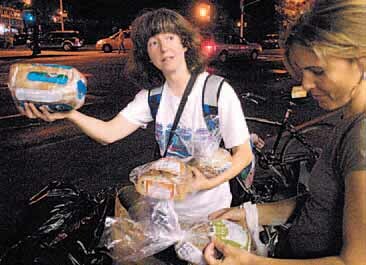 JANET KALISH, a freegan city school teacher, left, and Susan Belmonte find some bread on the street. Freegans hit the streets to forage for food, other goods among the city’s gourmet garbage. Adam Weissman carefully untied a garbage bag in front of a health food store on Sixth Avenue and rummaged through it. ‚ÄúAnyone want wheat grass? Kale?,‚Äù he asked.He pulled out loaves of whole-wheat bread that had just passed their expiration date and retied the bag as a sanitation truck pulled up. Weissman, 27, is unemployed ‚Äî by choice ‚Äî and lives with his dad in Hackensack, N.J. He calls himself a ‚Äúfreegan‚Äù and spends nights ‚Äúdumpster diving‚Äù at supermarkets, pizza joints and bookstores foraging for food and other goods not as a matter of survival, but as a political act. ‚ÄúRight now, too many people are working jobs we hate or are forced to exploit others in order to pay for commodities we don‚Äôt need,‚Äù he said. As Weissman and a handful of other freegans canvassed some trusty Village garbage spots this week, they handed out some of their booty to passers-by ‚Äî some welldressed people, some who looked like they needed food. There is a growing community of dumpster divers who share tips on garbage hotspots and give away their findings at makeshift markets around the city. ‚ÄúOur hope is for people to think about mass consumption, to think about the waste we produce,‚Äù he said. ‚ÄúWe normally think about products going from a store shelf to the trash, but we don‚Äôt think about the origins and what happens after we use and discard things.‚Äù Some of the freegans were more hard up for food, like Billy Pruz, 20, a Syracuse University student. ‚ÄúI‚Äôm like a pirate on a treasure hunt,‚Äù he said after scoring a cinnamon bun amidst bags of bagels on 14th Street. ‚ÄúEven if I had the money I wouldn‚Äôt want to spend it when there‚Äôs so much trash.‚Äù He enjoys trolling campuses to stock up on blankets, printers, tons of pencils and notebooks. Kalish, who, like many of the other freegans eats no dairy, vetoed stopping at a pizza place. She opted for a gourmet shop on Seventh Avenue, where they found barely wilted arugula and practically unscathed shitake and Portobello mushrooms, peppers and green beans. ‚ÄúFor people who pick through garbage, many of us are surprisingly picky eaters,‚Äù Weissman said. An installation CD of MS Office OSX. A box of 22 brand new paperback novels.